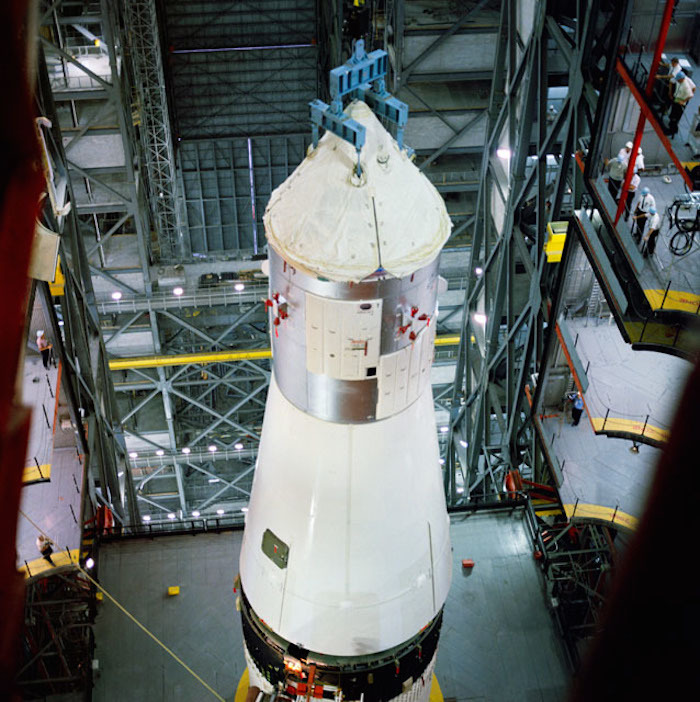 S67-36022 (20 June 1967) --- Apollo Spacecraft 017 is moved into position in the Vehicle Assembly Building's high bay area for mating with the Saturn V launch vehicle. S/C 017 will be flown on the Spacecraft 017/Saturn 501 (Apollo 4) space mission. S67-43593 (26 Aug. 1967) --- The completely assembled Apollo Saturn 501 launch vehicle mated to the Apollo spacecraft 017 on Launch Complex 39A, Kennedy Space Center. 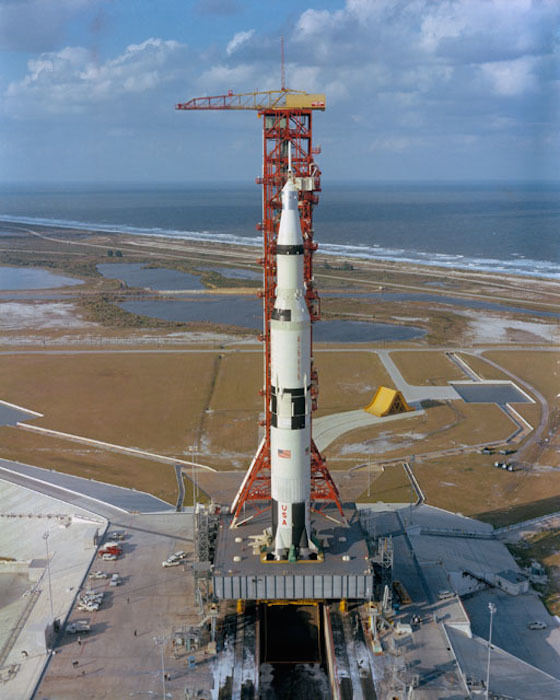 The fully assembled vehicle was transported to the launch complex on the crawler. S67-50903 (9 Nov. 1967) --- The Apollo 4 (Spacecraft 017/Saturn 501) space mission was launched from Pad A, Launch Complex 39, Kennedy Space Center, Florida. 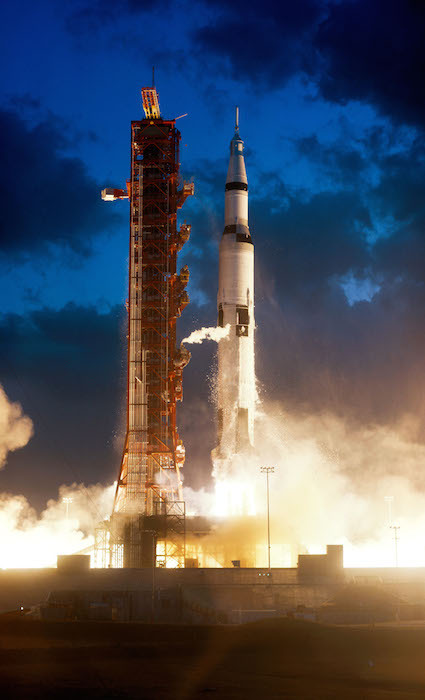 The liftoff of the huge 363-feet tall Apollo/Saturn V space vehicle was at 7:00:01 a.m. (EST), Nov. 9, 1967. The successful objectives of the Apollo 4 Earth-orbital unmanned space mission obtained included (1) flight information on launch vehicle and spacecraft structural integrity and compatibility, flight loads, stage separation, subsystem operation, emergency detection subsystem, and (2) evaluation of the Apollo Command Module heat shield under conditions encountered on return from a moon mission. S67-49447 (9 Nov. 1967) --- Close-up view of the charred heat shield of the Apollo Spacecraft 017 Command Module aboard the USS Bennington. The damage was caused by the extreme heat of reentry. The carrier Bennington was the prime recovery ship for the Apollo 4 (Spacecraft 017/Saturn 501) unmanned, Earth-orbital space mission. 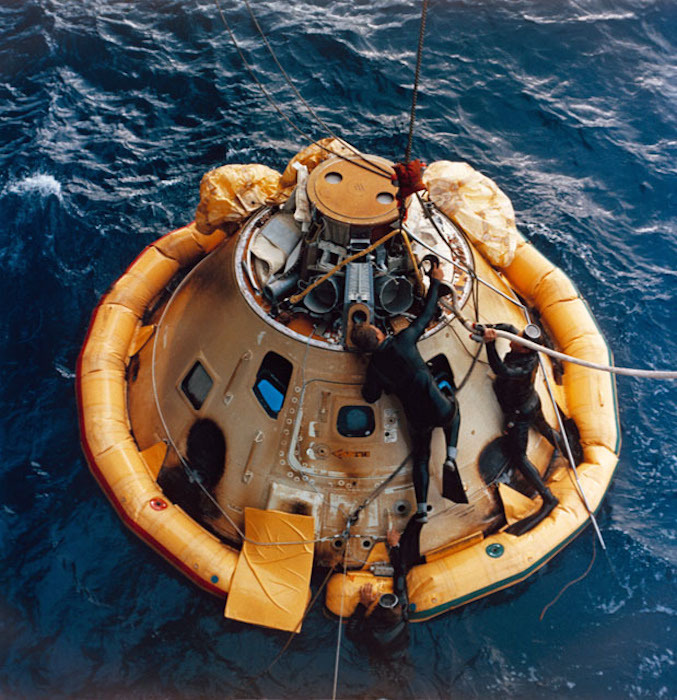 Splashdown occurred at 3:37 p.m. (EST), Nov. 9, 1967, 934 nautical miles northwest of Honolulu, Hawaii. 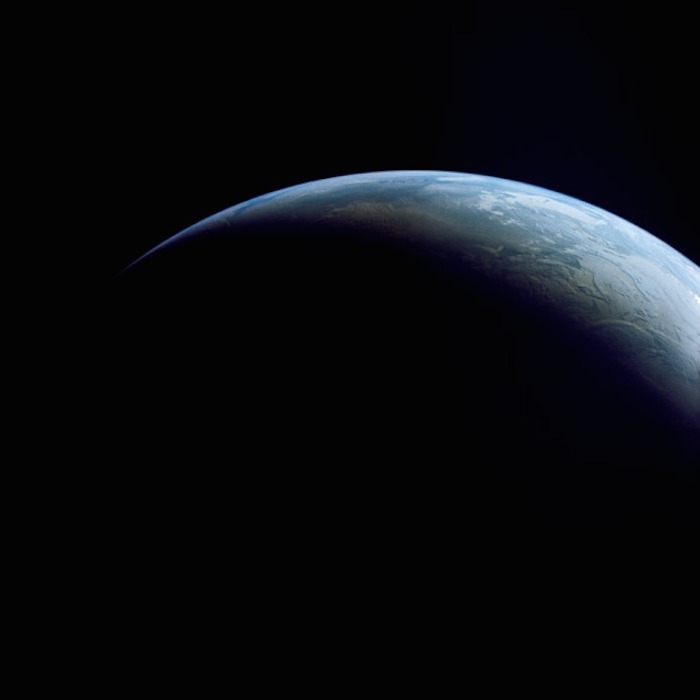 AS04-01-750 (9 Nov. 1967) --- Atlantic Ocean, Antarctica, looking west, as photographed from the Earth-orbital Apollo 4 (Spacecraft 017/Saturn 501) unmanned space mission. This picture was taken when the Spacecraft 017 and the Saturn S-IVB (third) stage was orbiting Earth at an altitude of 8,628 nautical miles. 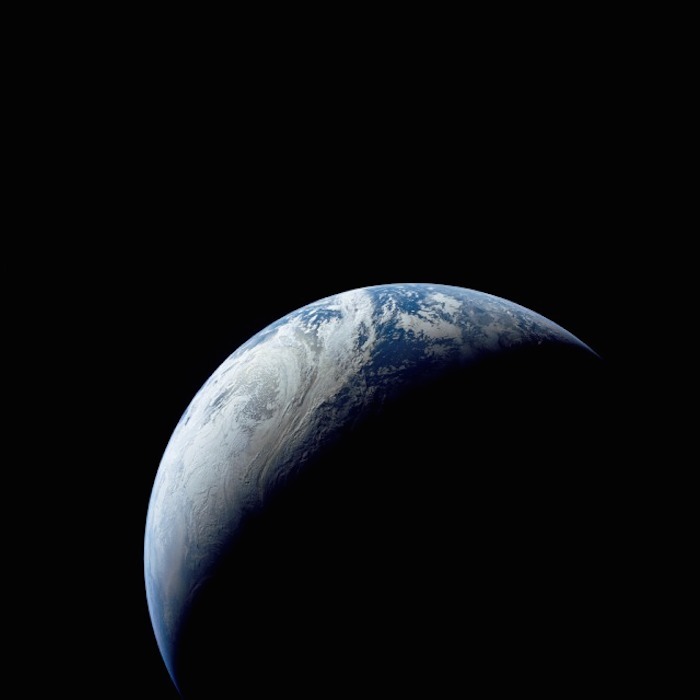 AS04-01-410 (9 Nov. 1967) --- Coastal Brazil, Atlantic Ocean, West Africa, Sahara, Antarctica, looking west, as photographed from the Apollo 4 (Spacecraft 017/Saturn 501) unmanned, Earth-orbital space mission. This picture was taken when the Spacecraft 017 and Saturn S-IVB (third) stage were orbiting Earth at an altitude of 9,745 nautical miles. 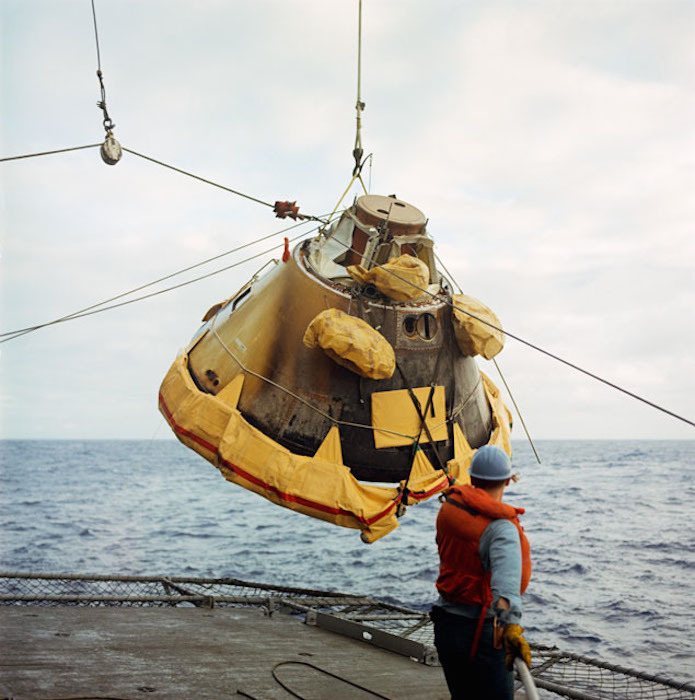 S67-49423 (9 Nov. 1967) --- The Apollo Spacecraft 017 Command Module, with flotation collar still attached, is hoisted aboard the USS Bennington, prime recovery ship for the Apollo 4 (Spacecraft 017/Saturn 501) unmanned, Earth-orbital space mission. The Command Module splashed down at 3:37 p.m. (EST), Nov. 9, 1967, 934 nautical miles northwest of Honolulu, Hawaii, in the mid-Pacific Ocean. 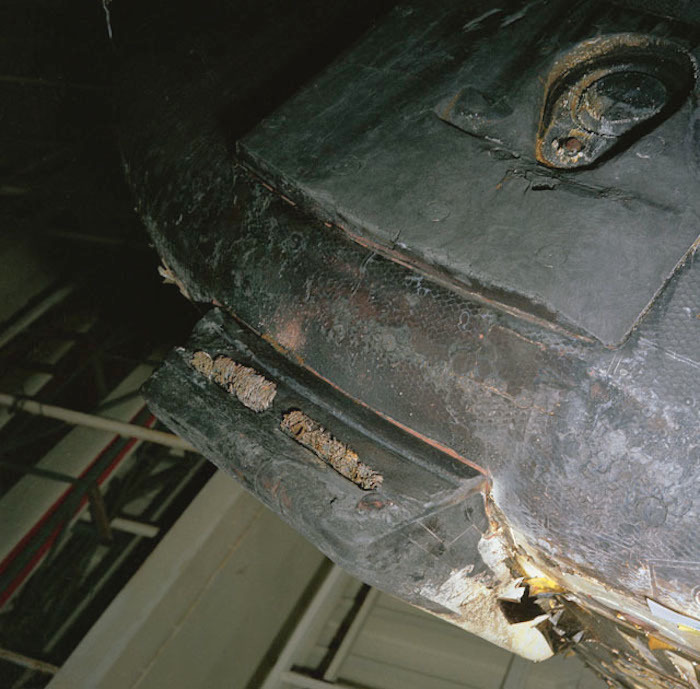 Note charred heat shield caused by extreme heat of reentry. 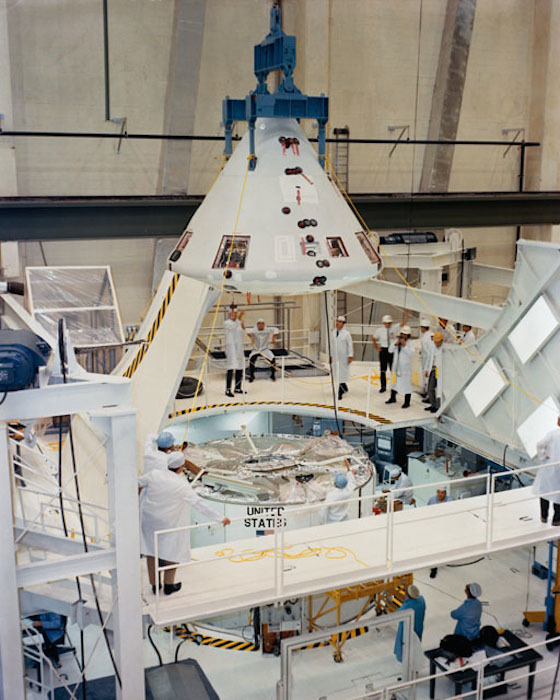 S67-50927 (November 1967) --- Lunar Module-1 being moved into position for mating with Spacecraft Lunar Module Adapter (SLA)-7 in the Kennedy Space Center's Manned Spacecraft Operations Building. LM-1 and SLA-7 are scheduled to be flown on the Apollo 5 (LM-1/Saturn 204) unmanned space mission. 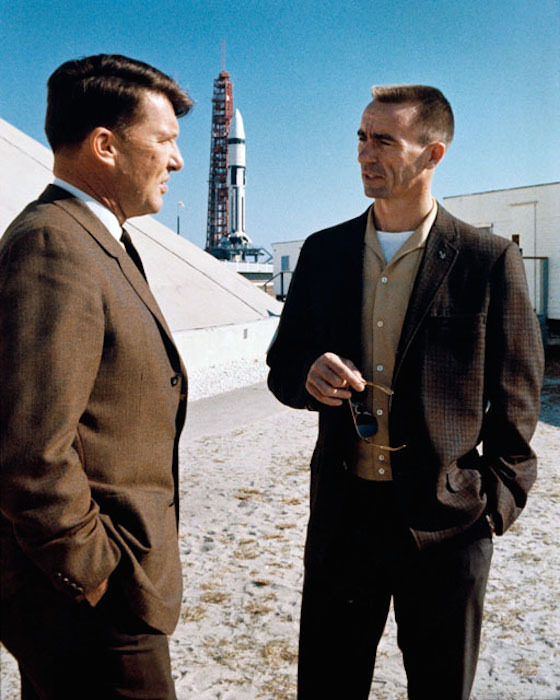 S68-18700 (22 Jan. 1968) --- Two prime crew members of the first manned Apollo space flight were present at Cape Kennedy for the launch of the Apollo V (LM-1/Saturn 204) unmanned space mission. On left is astronaut Walter M. Schirra Jr.; and on right is astronaut R. Walter Cunningham. 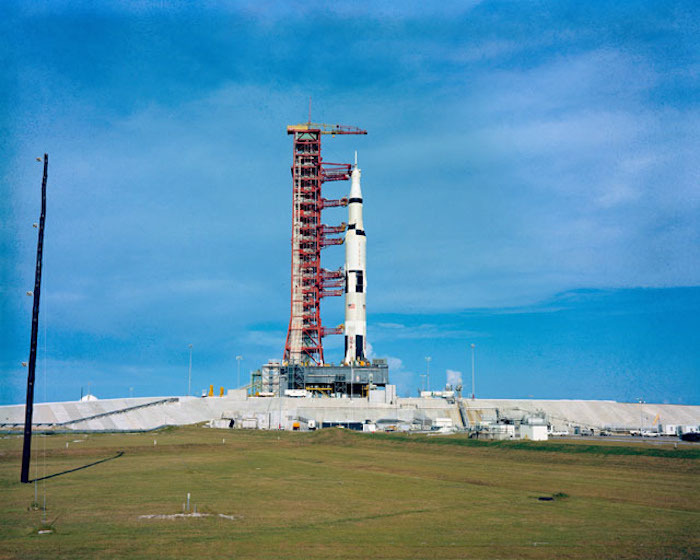 In background is the Apollo V stack at Launch Complex 37 ready for launch. 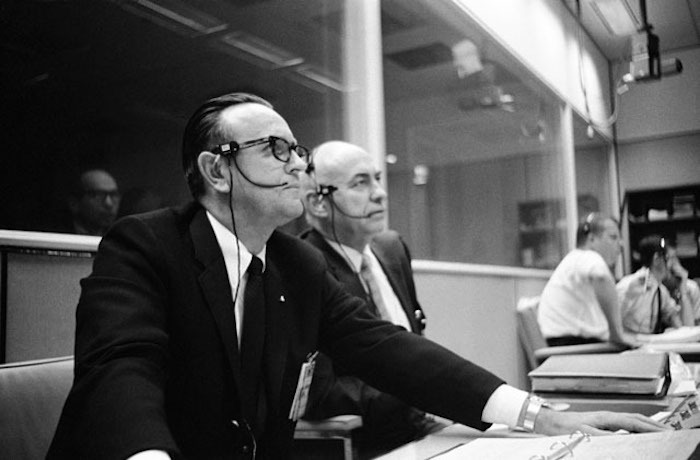 S68-18733 (22 Jan. 1968) --- Dr. Robert R. Gilruth (right), MSC Director, sits with Dr. Christopher C. Kraft Jr., MSC director of flight operations, at his flight operations director console in the Mission Control Center, Building 30, during the Apollo 5 (LM-1/Saturn 204) unmanned space mission. 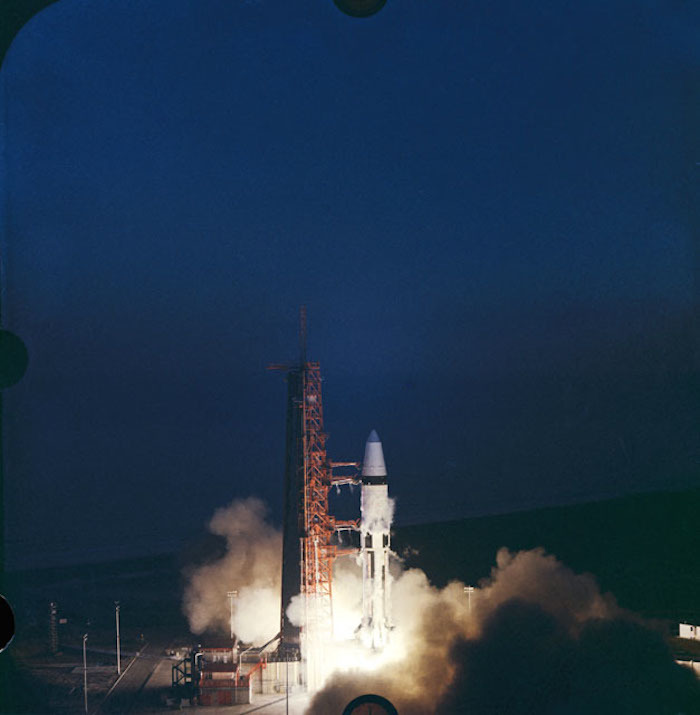 S68-19459 (22 Jan. 1968) --- The Apollo 5 (LM-1/Saturn 204) unmanned space mission was launched from the Kennedy Space Center's Launch Complex 37 at 5:48:09 p.m. (EST), Jan. 22, 1968. The Lunar Module-1 payload was boosted into Earth orbit by a launch vehicle composed of a Saturn IB first stage and a Saturn S-IVB second stage. The Apollo lunar module's first flight test was called a complete success. Ascent and descent propulsion systems and the ability to abort a lunar landing and return to orbit were demonstrated. S68-19460 (22 Jan. 1968) --- The Apollo 5 (LM-1/Saturn 204) unmanned space mission was launched from the Kennedy Space Center's Launch Complex 37 at 5:48:09 p.m. (EST), Jan. 22, 1968. The Lunar Module-1 payload was boosted into Earth orbit by a launch vehicle composed of a Saturn IB first stage and a Saturn S-IVB second stage. 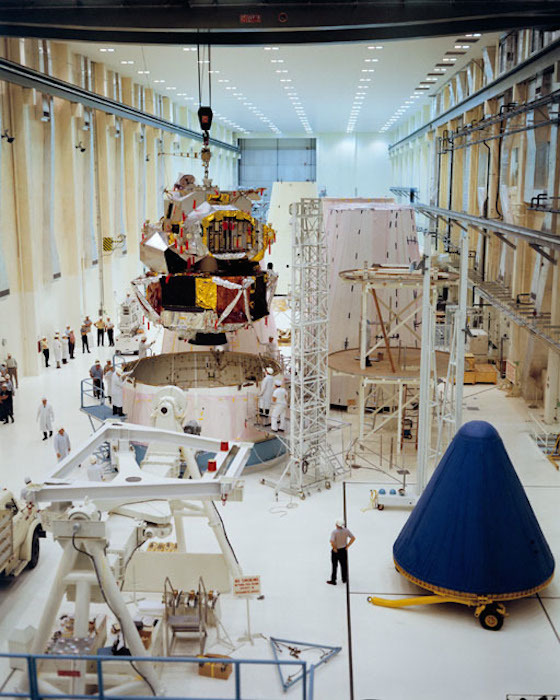 The Apollo lunar module's first flight test was called a complete success. Ascent and descent propulsion systems and the ability to abort a lunar landing and return to orbit were demonstrated. 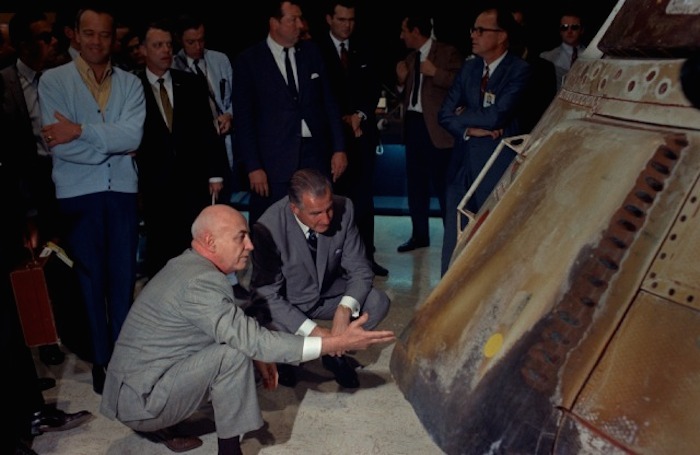 S69-42255 (28 October 1968) --- Dr. Robert R. Gilruth talks about the Apollo 6 unmanned mission's returned spacecraft during a visit to Houston by vice-presidential nominee Spiro T. Agnew. 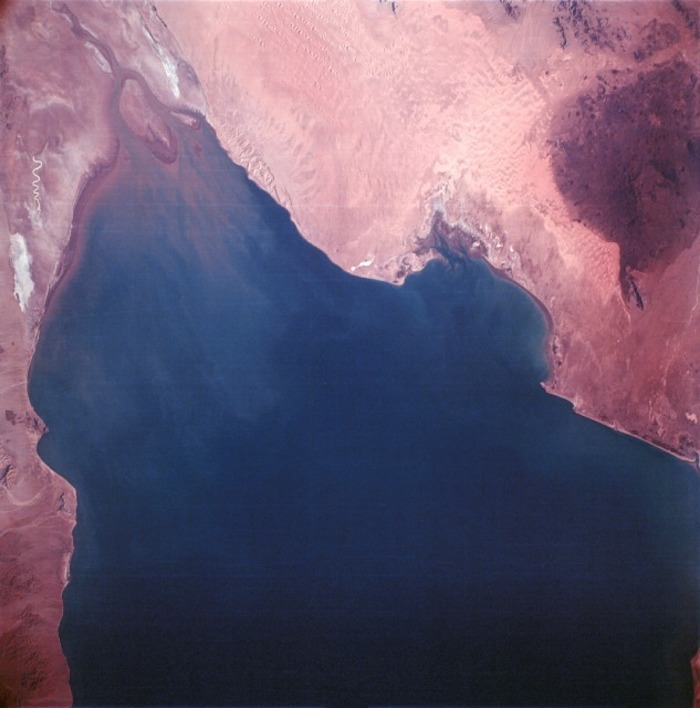 AS06-02-938 (6 April 1968) --- During the second revolution of the National Aeronautics and Space Administration's Apollo 6 spacecraft, this photograph of Senegal and Mauritania was taken at an altitude of 125 nautical miles. The predominant feature is the valley of the Senegal River (flowing to lower right). Lake Rkiz is to the left of the river in Mauritania. The Trarza Scrub Hills, a large area of elongated, fixed dunes, is in the lower left of the print. The land area seen in this photo is approximately 10,000 square miles or about the size of the state of Maryland. The photo was made one hour and fifty minutes after liftoff using a J.A. Maurer model 220G camera with Eastman Kodak SO-121 high resolution aerial Ektachrome film (exposure setting of f: 5.6 at 1/500 sec.). 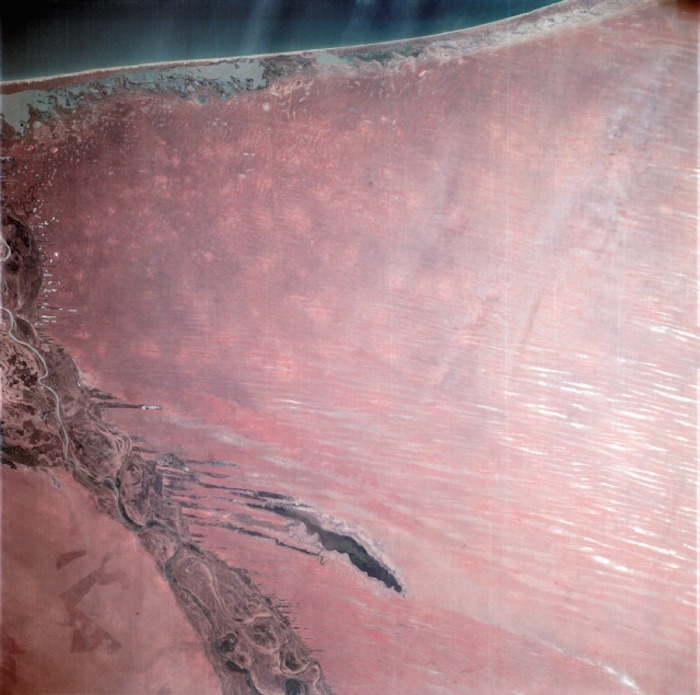 AS06-02-1436 (4 April 1968) --- View of the mouth of the Colorado River and the Gulf of California in northwestern Mexico as photographed from the unmanned Apollo 6 (Spacecraft 020/Saturn 502) space mission. Altitude of the spacecraft at the time picture was taken was 120 nautical miles. NORTH IS TOWARD LEFT SIDE OF PICTURE. At bottom edge of photograph is Baja California. In the upper left corner is the Mexican state of Sonora showing the Sonoran Desert and the Pinacate Mountains. This photograph was made three hours and seven minutes after liftoff using Eastman Kodak SO-121 high resolution aerial Ektachrome film (exposure setting was f/5.6 at 1/500 second) in a J.A. Maurer model 2200 camera. S68-17301 (6 Dec. 1967) --- Apollo Spacecraft 020 Command Module is hoisted into position for mating with Service Module in the Kennedy Space Center's Manned Spacecraft Operations Building. Spacecraft 020 will be flown on the Apollo 6 (Spacecraft 020/Saturn 502) unmanned, Earth-orbital space mission. S68-20986 (4 April 1968) --- Scene at the flight operations director's console in the Mission Control Center, Building 30, during the Apollo 6 (Spacecraft 020/Saturn 520) unmanned space flight. 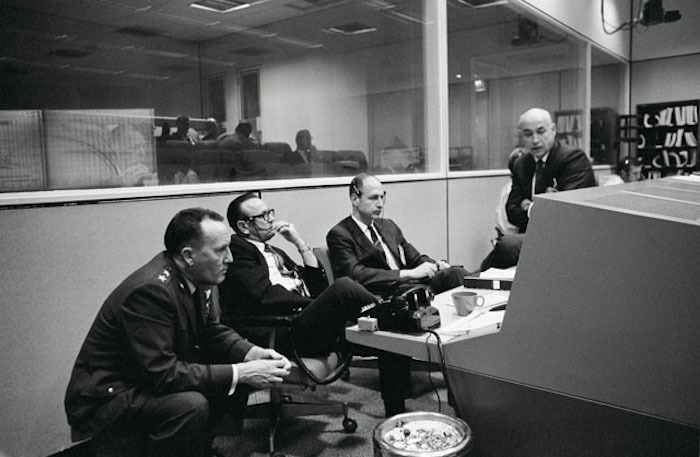 Left to right, are Air Force Maj. Gen. Vincent G. Huston, DOD Manager, Manned Space Flight Operations, Andrews Air Force Base, Washington, D.C.; Dr. Christopher C. Kraft Jr., MSC director of flight operations; George M. Low, manager, MSC Apollo Spacecraft Program Office; and Dr. Robert R. Gilruth, MSC Director. S68-27364 (4 April 1968) --- The Apollo 6 (Spacecraft 020/Saturn 502) unmanned space mission was launched from Pad A, Launch Complex 39, Kennedy Space Center (KSC), Florida. 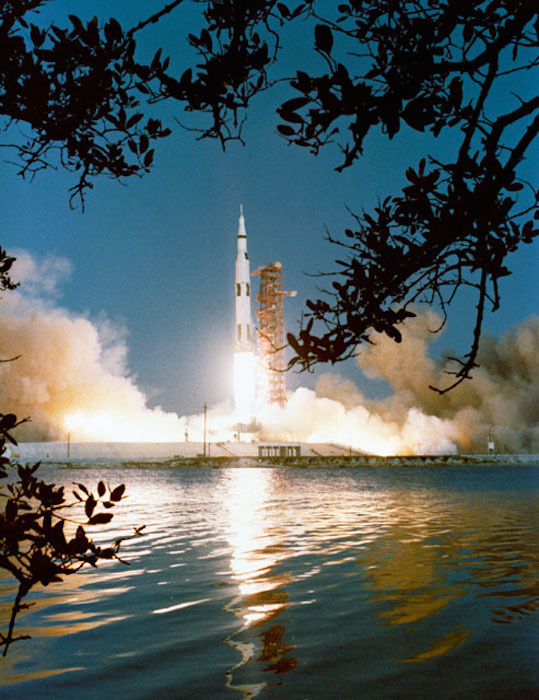 The liftoff of the huge Apollo/Saturn V space vehicle occurred at 7:00:01.5 a.m. (EST), April 4, 1968. S68-27365 (4 April 1968) --- The five F-1 engines of the huge Apollo/Saturn V space vehicle's first (S-IC) stage leave a gigantic trail of flame in the sky above the Kennedy Space Center seconds after liftoff. 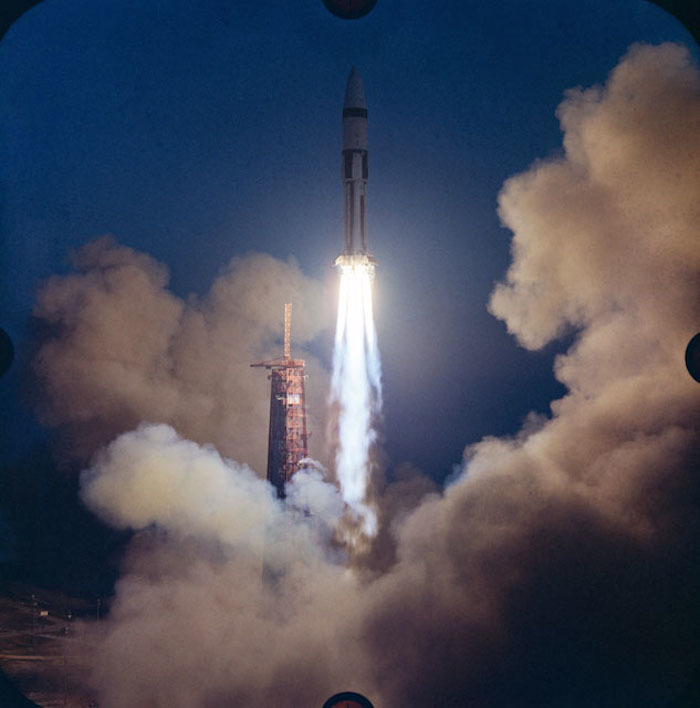 The launch of the Apollo 6 (Spacecraft 020/Saturn 502) unmanned space mission occurred at 07:00:01.5 (EST), April 4, 1968. 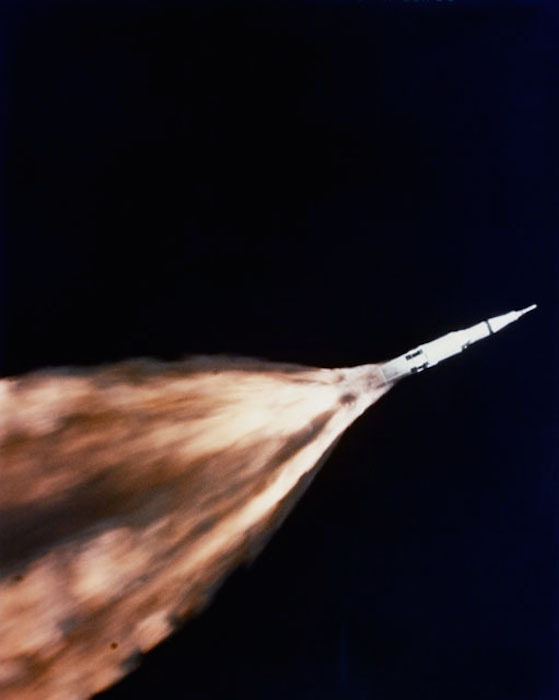 This view of the Apollo 6 launch was taken from a chase plane. S68-27884 (4 April 1968) --- A U. S. Navy frogman team prepares the Apollo Spacecraft 020 Command Module (CM) for hoisting aboard the USS Okinawa. The USS Okinawa was the prime recovery ship for the Apollo 6 (Spacecraft 020/Saturn 502) unmanned space mission. Splashdown occurred at 4:58:45 p.m. (EST), April 4, 1968, at 375 nautical miles north of Honolulu, Hawaii. 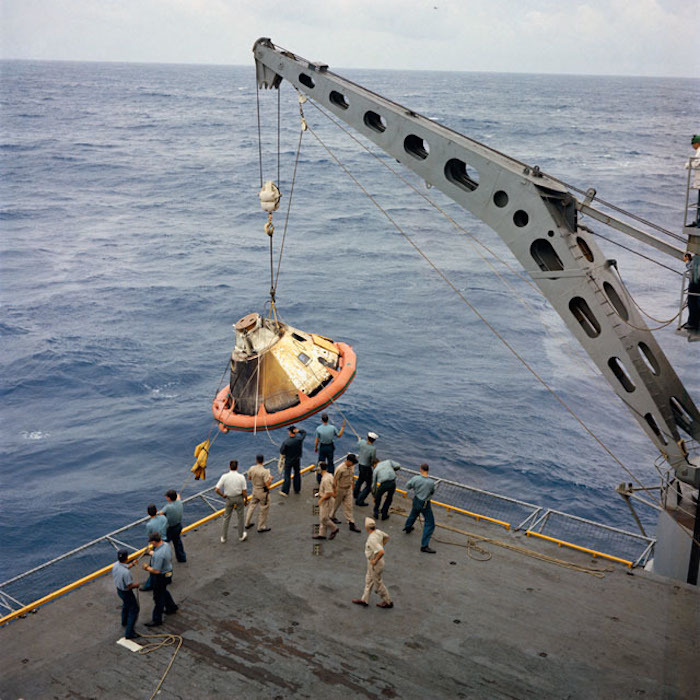 S68-26989 (4 April 1968) --- The Apollo 6 Spacecraft 020 Command Module is hoisted aboard the USS Okinawa.